Victory Over the Sun was written by Signal To Trust and released in 2003 on their self-titled 7″ on Modern Radio. 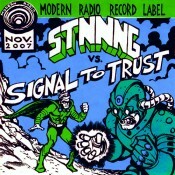 Dubbed Warehousing was written by STNNNG and was released on their 2006 full-length, Fake Fake on Modern Radio. Artwork for this split was designed and printed by David Witt. The 7″ was pressed in a limited quantity of 400. This record was given away free with admission, at the 5th Annual Lunch Show on November 17th, 2006 at First Avenue’s 7th Street Entry.